Every community experiences the same pattern of stages from the day they launch. Whether the community is a blog, discussion forum, social network, or a business start-up, the hype cycle is as predictable as the morning sun. Technology Trigger – this is basically the launch. Peak of Inflated Expectations – this is the peak of the initial hype from the launch and earlier marketing campaigns. Trough of Disillusionment – this is the crash, the hangover, and usually the start of negative opinions being expressed. Slope of Enlightenment – those that stick with it begin to realise the true value. Plateau of Productivity – the features and benefits become well known and opinions stabilise, generally in the positive. Although the Gartner Hype Cycle is normally used to describe a technology or physical product, it applies equally to communities as well. The intersection of these two applications is in technology platforms that are in themselves community driven. The best example of this in recent years is Twitter. If you trace back through the rapid rise of Twitter the public opinion and “wow” coverage from mainstream media was overwhelmingly positive. The peak of this hype was right around the time Oprah issued her first tweet. Shortly after that “Oprah moment” the backlash began, as Twitter dove into the trough of disillusionment. Early adopters criticized Twitter for lack of innovation, becoming overrun by users, excessive spam, and for generally being useless. Traffic numbers were criticized, Twitter was declared dead compared to Facebook which was experiencing its own rapid ascent to the peak of inflated expectations. But in the last 6-12 months the Twitter community has stabilized. People have a more realistic expectation of Twitter’s benefits and limitations, and are using it in the ways that it can benefit them rather than expecting it to deliver all of their needs. 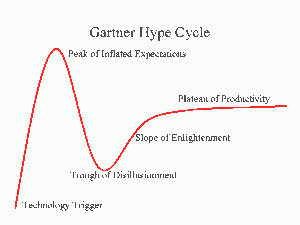 So what can you learn from the Hype Cycle and apply to your own community? The best place to start is by setting your expectations correctly. The Hype Cycle will happen; it is only the degree to which it swings between peak and trough that you might have some influence over. If you’re launching a new blog and you plan your launch well you can expect an initial burst of and enthusiastic commentary from readers. Your Twitter stream might light up with retweets and people will describe your insightful posts as “great”, “important”, and “amazing”. If you’re launching a new forum or membership site you can expect a similar burst of enthusiastic discussion. The forums will fill up with introductions, questions, generosity, and sharing of each other’s outside content. When that peak occurs you should be prepared for the ensuing trough. It might be a dip in , or a sudden drop in comments and retweets, or forum threads starting to see zero replies. You might even notice subscribers drop off, some bickering among members, or outright criticism. You haven’t even done anything wrong. It’s just that keeping people’s attention and excitement for long periods of time is not easy. With the inevitable trough approaching your focus should be on reducing its depth. Plan to cushion the fall with a secondary launch event. For a blog this could be a reader contest, the release of some killer free content, or a guest blogging campaign to attract fresh readers. For a forum or membership site look at releasing new features, running a new member campaign, or rewarding active members for driving conversation. The key is to find ways to bring in new readers or members that will experience their own personal Hype Cycle that is out of sync to those who joined your community on Day 1. With the right numbers their peak will cushion, or even completely offset, the trough being experienced by your original community members. The fresh faces and voices in the community give new energy to even the most disillusioned people in your community. If you efforts are successful you will notice your original community members emerging from their trough and beginning to climb the slope of enlightenment. While this is going on the second wave, and any subsequent waves of new members, will start to experience a more stable peak/trough cycle themselves. In most cases they will skip it entirely. As new members come in their expectations are more accurately set by the existing community activity levels, and they aren’t swept up in the high peaks and low troughs of that initial cycle. When you think about this plateau don’t think it means your will stop climbing. Rather you should think of it as the time when your community becomes stable and more self-sustaining. You’ll know it when you see it. For a blog this is when you start to notice a core group of commenters who become involved in their own discussions on your blog posts. You will see them responding to questions from other readers and defending you against critics. For some long-time bloggers this is the point at which they stay out of their own blog comments almost completely. Though this might sound like a blogger who no longer engages with their audience, usually they will use other methods to engage such as Twitter, forums, premium membership areas, or by using blog posts as discussions. Forums also make it fairly easy to spot this stage of the Hype Cycle. When a forum becomes self-sustaining the owners can sometimes step back and focus mainly on delivering new features. When you’ve made it to the plateau you’re on easy street. Well not really, there is still a lot of hard work involved in maintaining value and steady growth for a community. Watch out for events that can restart the Hype Cycle. A small group of your community might start complaining, or you start to feel the need to make big changes to freshen things up. But these kinds of events can be mishandled and kick off a new cycle. If you consider the Hype Cycle to be an inevitable part of any new community then you can put in place strategies to manage it. Anticipate the peak – know that the initial burst of positive enthusiasm will come to an end at some point. Avoid re-cycling – always be mindful of the Hype Cycle and how major changes can cause it to restart. Paul Cunningham writes practical blogging tips and tutorials at BloggingTeacher.com to help bloggers overcome the many challenges they face building a successful blog. Follow @paulcunningham on Twitter. This is brilliant, Paul. I have launched a number of online communities and thinking back, they all followed these patterns. Some of those communities completely failed after they peaked. If the trough is too deep, it could be what stalls the whole thing and fails. I appreciate the practical suggestion of a second launch to cushion the trough. What are the things that you’ve done to keep the community stable after the first peak? It was a lot of personal investment to create the momentum. That could be expressing appreciation, letting people know they are heard, beginning new conversations, or sometimes overtly asking those most passionate to stick with it and help make it work. All those things are a relational approach instead of a marketing approach. Even just a couple of people can set a tone. I think, accidentally, we were helped by a second marketing swing like Paul described as well. Fab post, Paul. After relaunching my site and distributing an eBook only 3 weeks ago, I’m just coming out of number 3, the Trough of Disillusionment. Let me tell you, it’s hard going. So thank you for outlining the next stages and making it that little bit easier for me, now that I know what to do and expect! Yes, it also applies to your own experience during those launches! Once your initial excitement and enthusiasm wears off its a lot of hard work to go the rest of the way. Excellent post. Love it. As usual, Paul, you’ve written something insightful and useful, which is a rare combination. I’ve bookmarked this post (well, I’m just about to, on Delicious), because it will definitely help me with my upcoming newsletter launch, and also future ebook launches. Thanks mate. Remember you and your subscribers will experience the cycle differently. One way to cushion your own trough is to create feedback loops. Getting a bit of feedback from your subscribers once in a while helps keep your own enthusiasm and energy up, which in turn helps you deliver great new stuff to smooth out the cycle for your subscribers. The Feedback loops concept reminds me of something I heard the other day called tennis match marketing and I thought it was brilliant.